FINAL DAYS ALERT: This sale ends on September 30, so order your Zap Calendar or Sign Me Up! subscription or renewal before then to receive the 25% off discount. We are celebrating Zap Calendar's 12 birthday with a sale! 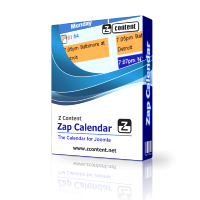 Development of Zap Calendar began 12 years ago in 2006 (who remembers Joomla 1.0?) for use as a calendar for a private school web site running Joomla. In those 12 years, Zap Calendar has been continuously improved upon by the original developer, adding new features and add-ons to make Zap Calendar the best Joomla calendar available (BTW, Zap Calendar still is a great calendar for a school web site with support for both calendar year and school year display). Today there are over 30 Zap Calendar add-ons available. To help celebrate, all Zap Calendar and Sign Me Up! subscriptions and renewals (basic, standard and pro) are 25% off the regular price for a very limited time. We do not have a sale very often, so now is a great time to order or renew your subscription. This discount also applies to our basic subscription, so a new Zap Calendar subscription can be purchased starting at under $22 USA. 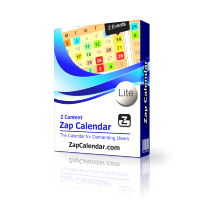 If you are using Zap Calendar Lite, now is a great time to upgrade to a paid subscription to receive additional add-ons at a really great discount. Your subscription entitles you access to the latest version of Zap Calendar or Sign Me Up! and add-ons. And unlike many other Joomla extensions, our subscriptions are for a full 12 months of updates and support. So if you are interested in purchasing or renewing your subscription to Zap Calendar or Sign Me Up!, now is the best time to get it. But hurry, this offer is very limited. The discount is already applied to the product price, no coupon needed. Click here for Zap Calendar product and ordering information. Log in to the Z Content website at http://zcontent.net, and select the "My Account / Create Account" option at the top of the page. Log into the site and select the "My ZApps" option at the top of the page. From there, you can click on the "Renew" or "Upgrade" button to renew or upgrade your subscription. If you don't remember your login or password, you can select the "forgot your username/password" options on the login page. If you need additional help, you can send an e-mail to support@zcontent.net for additional assistance. Please vote for one or more of our extensions at the Joomla Extensions web site. Your vote and/or review tells others that you are a satisfied user of Z Content products. Not satisfied? Contact us and we will see what we can do to help. Like us on Facebook to get up to the minute news and tutorials on Zap Calendar and Zap Weather. Click here to visit our Facebook page.